What’s for dinner? The Musher Meal Menu. 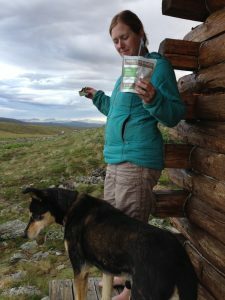 We talk often about how we feed the dogs while on our cold weather mushing adventures, but we rarely get around to talking about what we eat. Just like the dogs get fed a high fat, high protein meal that is the equivalent of “doggy rocket fuel” (the term coined by Megan Moody), we as humans also need a high-octane meal to keep us going on the long, cold, winter nights. Imagine this scenario if you will, it is 4 a.m., you just ran your team 65 miles from Pelly Crossing towards Dawson City during the Yukon Quest. This run took about 8 hours so the last time you ate a meal was sometime the evening before. 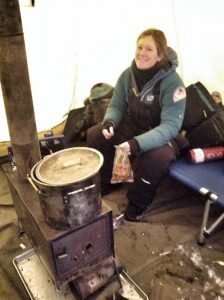 The temperature is -35 F. You stop to camp your team to feed and rest them on the side of the trail. Dog care always come first. Dogs are unclipped from their tuglines so they can get comfortable, booties are taken off, the dog cooker is started to melt water, the dogs are all checked for stiffness or soreness and massaged if needed, more snow is put in the cooker, dog jackets are put on, more snow is put in the cooker, and straw is put down for the dogs. Okay, time to make dinner. As we do all of our chores we are constantly tending the cooker to make sure we have an efficient use of the cooker fuel to melt snow into hot water, in this case we are using methanol. The cooker is a 3.5-gallon stock pot that sits at the top of a 5-gallon steel bucket with air venting cut into it. 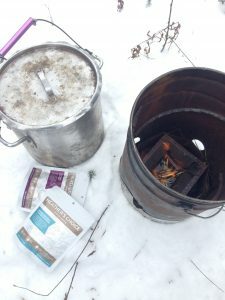 In the bottom of this cooker bucket, there is a special burner that we pour one of the many alcohol solutions into and it burns superhot with blue flames melting snow at extremely hot temperatures. We make enough hot water to add to the dog’s food and make a warm mix of meat, kibble and fat or “doggy rocket fuel”. At the same time, we are making musher rocket fuel. We have two main types of food we use on the trail. 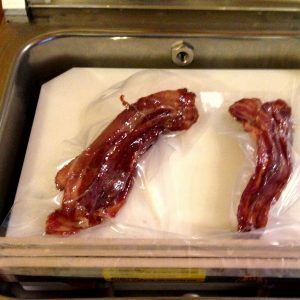 We either use frozen food prepackaged in vacuum seal bags that we drop into the hot water to thaw and heat up or we can add the hot water to a dehydrated meal. We use the hot water accordingly for whichever meal we chose, place the meal in an insulated container and then feed the dogs. Once the dogs are licking their chops in content, it is human dinner time. Both types of food have their advantages and disadvantages, so we use them at different times. In this instance, I used a Heather’s Choice Salmon Chowder dehydrated meal. A close up of the dog cooker. Alcohol is poured into burner in the bottom of bucket on right. The cooker has turned snow into boiling and steaming water. Ready for dog food and human food. Let’s start by talking about the frozen meals. 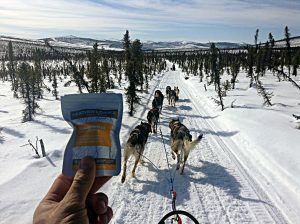 The frozen meals are great choice for most mushing scenarios. The food is already cooked, it just needs to be thawed out and heated up which makes it very simple. 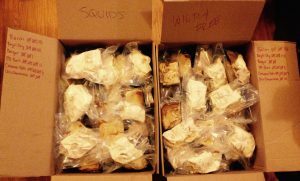 We rely on our friends over at Hard Eats in Fairbanks to make much of our frozen pre-packaged vacuum sealed mushing meals. Besides their amazing food from their food trailer, they specialize in making high calorie, high fat, easy to eat options for people on the go. Many of their food choices are wrapped in a tortilla for extremely easy eating with no need for utensils. I often will heat up a breakfast burrito before getting ready to start a run. I can put that burrito inside my chest pocket in my bibs and it not only heats me up, but my body heat keeps it warm for a couple hours until I get hungry on the trail. Then boom, warm breakfast burrito on the go. They also make fruit smoothies and soups that I will often put in a thermos for later and helps with human hydration which is just as important as dog hydration. All of the tasty frozen food options prepared for our 2015 race season by Hard Eats. Paige enjoying a meal from Hard Eats at Dawson dog camp during her 36 hour layover in 2017. One consideration when using frozen meals is that they can take several minutes of soaking in boiling water before they are thawed and warmed. The other consideration is the weight and space of the frozen meals. They are a great option for checkpoints or cabin use as they can be heated several different ways to be eaten. I try to make sure I have these meals at all checkpoints and at least one burrito for each leg of my race, so I can have a hot treat on the trail. I know when I eat one of these meals, I will not be hungry for a while! A huge thanks to Hard Eats for their support of Team Squid. 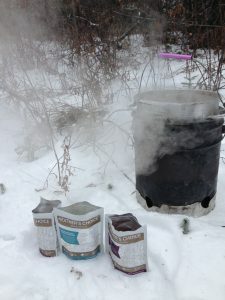 The dehydrated meal option is one that we have used for years, but until recently was mainly used as a backup option. Anyone who has lived a few days on Mountain House can attest to desire for something tastier and the desire to not take so many bathroom breaks. 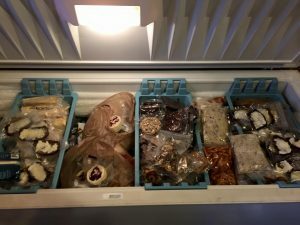 A couple years ago we found Heather’s Choice dehydrated meals. They are an amazing lightweight, space saving, high octane option and they are tasty. 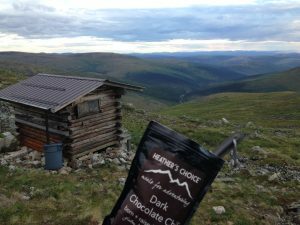 We have been testing all the Heather’s Choice options over the past year on all our adventures, summer and winter and are happy with the results. They are made from healthy, natural ingredients that leave you feeling good. We as dog mushers joke that we talk about poop more than anybody, we probably do. So here we go. I mentioned Mountain House meals before, most brands of dehydrated meals have some weird preservative of something that doesn’t quite jive with normal intestinal action. They either leave you feeling stopped up or the opposite. Neither are what you want when you are out for days on end in adverse conditions. The Heather’s Choice meals leave us feeling good, energized and all normal below the belt. 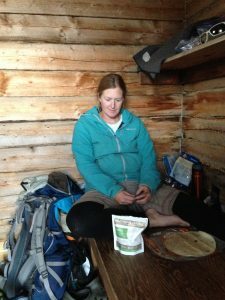 We did a test on a backpacking trip this past summer on the Pinnell Trail and we ate only Heather’s Choice food for 3 days. We had the energy we needed and felt great. 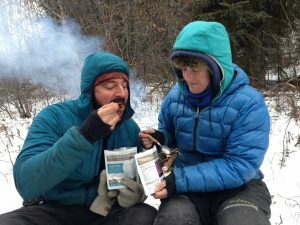 Enjoying some Dark Chocolate Chili on the Pinnell Trail this past summer. Paige and Stout enjoying some Tomatillos Rancheros on the Pinnell Trail. Sing it now.. The waiting is the hardest part. Another plus with the Heather’s Choice meals is that they are small and lightweight. This makes them a ideal choice for long stretches on the Yukon Quest like the 205 mile section between Pelly Crossing and Dawson City. 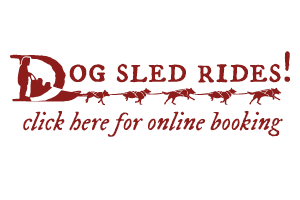 Here a musher must carry everything they need for humans and dogs for with them. There is no resupply. Dogfood alone for that section can weigh about 200 pounds, there is no skimping or lightening the dog food load, so we must do it in other ways, like lightening our personal food and gear. The space and weight saved by these dehydrated meals is a huge bonus. 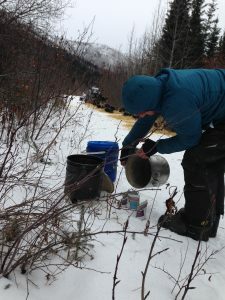 Cody pours boiling water into Heather’s Choice meals on a training camp last week. Dehydrated meals need to sit for a period so that the food can be rehydrated by the hot water. This can be difficult to achieve in very cold conditions, so we made a small insulated pouch out of reflective bubble wrap insulation. 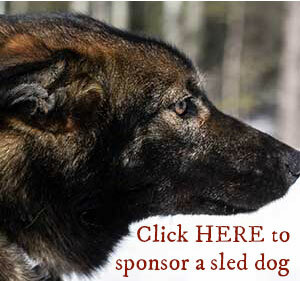 We add our hot water to our meal and then place it in the pouch and tuck it back in the sled while we feed the dogs. The meal is ready when we finish. Heather’s Choice has a bunch of tasty natural options. Our favorites include: Doro Wat with Quail meat, Smoked Salmon Chowder, Dark Chocolate Chili, Rancheros Tomatillos and they have several high octane hot breakfasts that are very tasty as well. We are proud to be brand ambassadors for Heather’s Choice and excited to test new developments on the trail. Hard Eats candied bacon snacks. 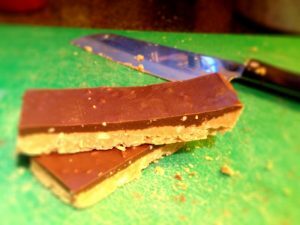 Some super rich chocolate peanut butter bar snacks from Hard Eats. A mix of snacks from Hard Eats with a Lusty Cake right in the middle. As far as snacks go, we try to eat snacks with lots of calories as we move down the trail. We try to eat lots of nuts, granola, coconut, dried fruit and dark chocolate. Hard Eats has made us some of the most amazing high-octane snacks for the trail. 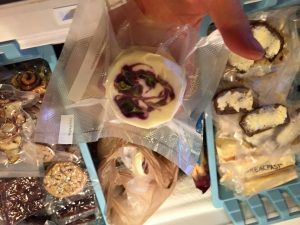 Some past options include candied bacon and oreo bars all vacuum sealed and ready to throw in your pocket for later. Lusty Cakes has made us some amazing miniature cheese cakes that have enough fat to keep us going for hours. They are less on the healthy side, but they are packed with calories and fat and it precisely what we desire at -40. Another great snack option are the Heather’s Choice Packaroons. They are small coconut based snacks that pack an energy punch. They come in a package of two and each Packaroon, depending on ingredients, has roughly 200 calories. That is approximately the same as a snickers bar. These have become one of our favorite snack foods on all of our adventures regardless of the season, hiking, kayaking, backpacking, it is hard not to just eat them at home. If you are planning a winter adventure this year, I recommend these three companies. If you based your diet on these foods, you won’t be disappointed in your ability to stay warm, have plenty of energy and feel great. 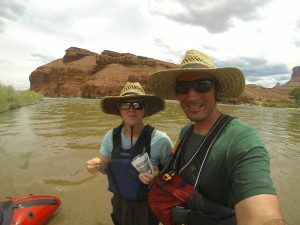 Enjoying some packaroons while pack rafting on the Colorado River outside Moab this past summer. A tasty snack while camping in the White Mountains last spring. 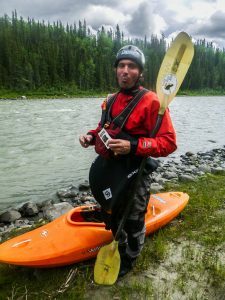 Cody getting an energy burst from the espresso packaroons while kayaking on the Nenana River.